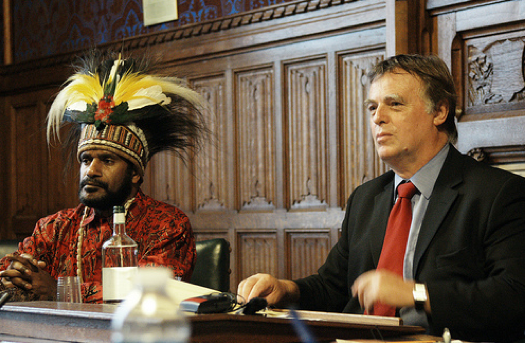 The Free West Papua Campaign was launched in 2004 in Oxford, UK. We have grown from being a volunteer organisation through to having permanent offices in Oxford (UK), The Hague (Netherlands), Port Moresby (Papua New Guinea) and Perth (Australia). We are a group of people from human rights, political and environmental backgrounds, a number of whom are West Papuans or have spent time in West Papua. Our leadership comes from West Papuan representatives internationally, and in West Papua itself. We have no religious, party-political or corporate affiliations, and we are determinedly non-violent. Our funding comes from donations, the sale of merchandise, public fundraising events and occasional grants from charitable foundations. 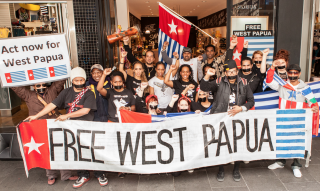 For more information about the aims and structure of the Free West Papua Campaign please take a look at our Guidelines for Free West Papua Supporters and Groups. As founder of the campaign, West Papuan independence leader Benny Wenda provides the political leadership and direction of much of our work. In the early 2000s, Benny Wenda was elected the head of DeMMak, a pan-tribal assembly in West Papua which works peacefully for independence. Benny Wenda was forced to flee his homeland after he was arrested, tortured and threatened with death by Indonesian police. He now lives in the UK with his family, representing his people in exile and in 2004 he founded the Free West Papua Campaign. Benny Wenda has been twice nominated for the Nobel Peace Prize and in 2014 was elected as the Spokesperson for the United Liberation Movement for West Papua (ULMWP), an internationally recognised organisation, uniting all West Papuan independence groups. In 2017, Benny Wenda was elected as the Chairperson of the ULMWP. You can read more of Benny’s story here.